March is the perfect time to clean up your landscape to prepare for the spring growing season. In fact late March is the best time because new growth hasn’t completely emerged, making it easier to see the structure of the plants. For the same reason, this is also the best time of year to check the irrigation system. Once freezing temperatures are no longer a threat, get the irrigation system back up and working to support new spring growth. The greater Albuquerque area occasionally gets a freeze as late as the middle of April. So although you may be eager to crank on the irrigation system and begin automatic irrigation, don’t forget that pipes may be susceptible to bursting if there is water in them and we receive a late frost. 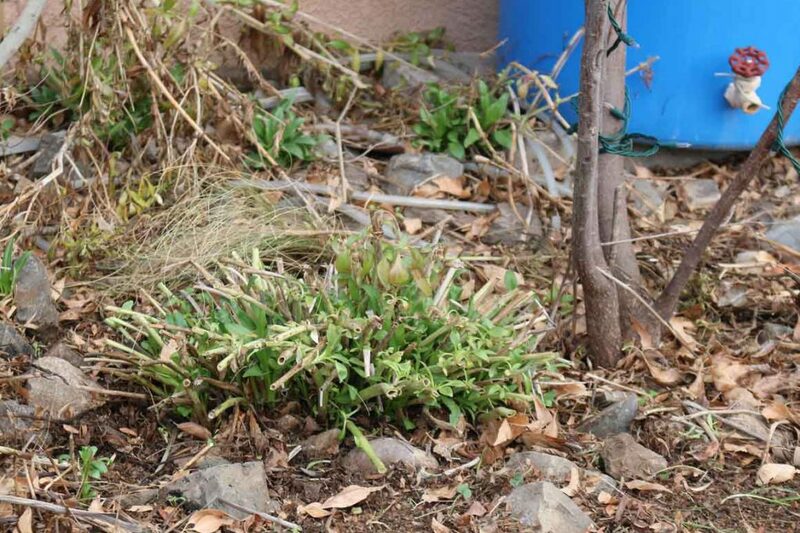 Remove: Cut back or dig out dead or dying plants or plants that have outgrown their space. Replace: If the plant has not been successful, think about what factors made it this way. Replace plant material with an alternative better suited to the location. Divide: Break up one plant into multiple plants for distribution in other places in the garden or share with friends and neighbors. This is a great chance for you and your neighbors to try new plants. It is good practice to leave perennials intact over the winter, leaving stems, dried leaves, and seed heads on the plant. This helps insulate the plant over the winter, can be aesthetically pleasing, and provide forage for wildlife. Come Spring, it is time to cut back the perennials and clean up the debris around and underneath them. 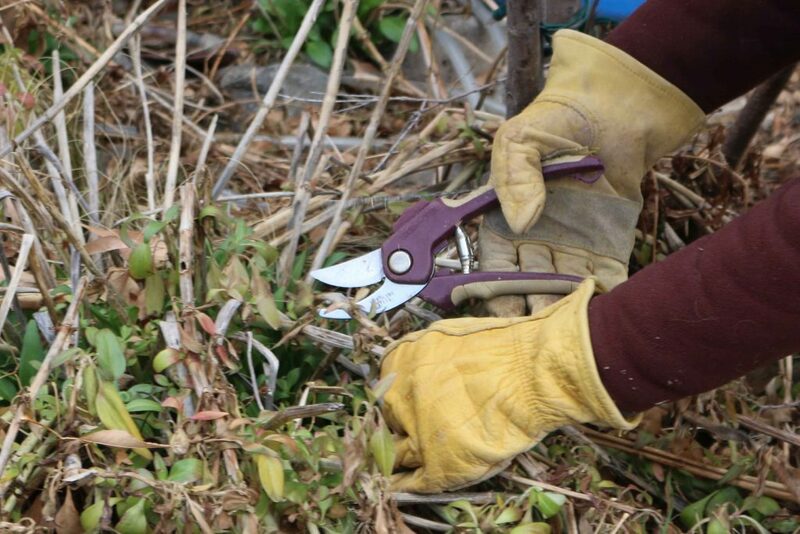 Pruning shears, a wire rake and gloves are good tools for this task. An example of a typical perennial is listed below. Valerian (typical of many flowering plants and perennials): prune dry stalks just above any live growth to allow the new leaves and stems greater access to energy-producing sunlight. 2. 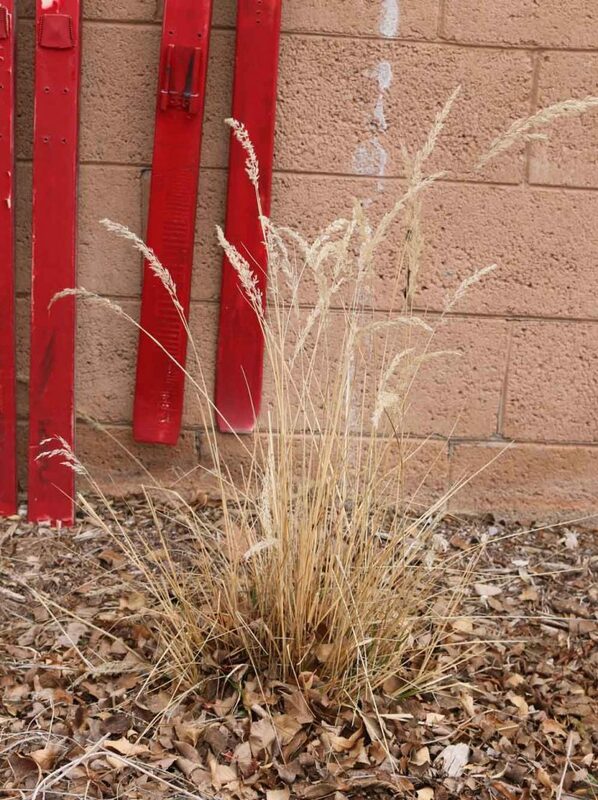 Trim Ornamental Grasses and Rake Out Turf Grasses. Most ornamental grasses are deciduous and produce new growth each spring. These grasses should be cut back around this time of year for best aesthetics and to allow new growth to emerge unencumbered. Most grasses fall into this category. 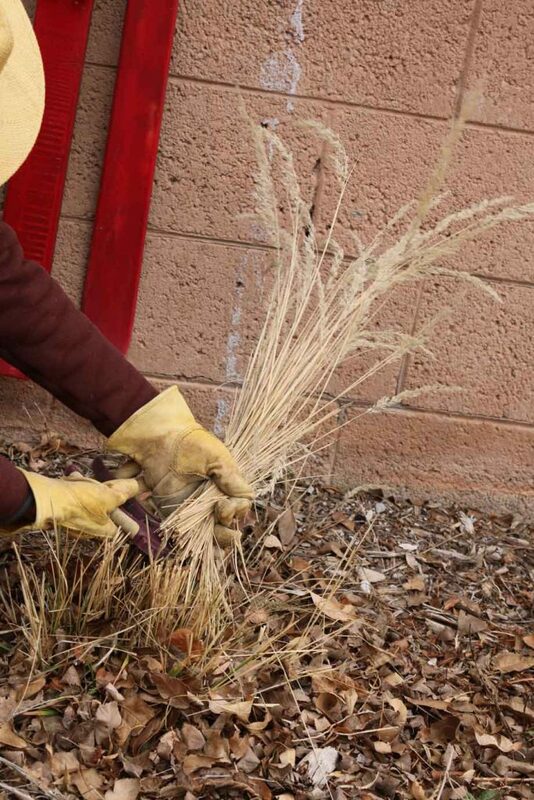 Other grasses and grass-like plants will respond negatively to being cut back in the spring. These include yucca, bear grass (nolina), and sotol. 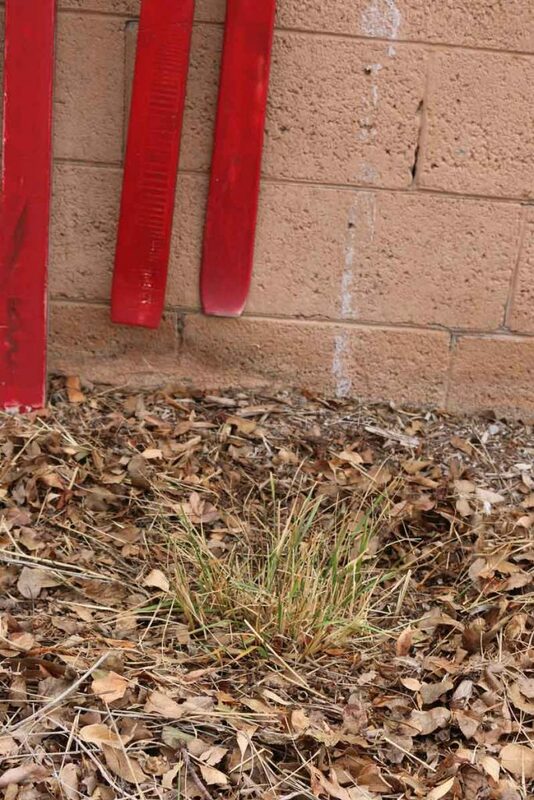 Selectively remove tattered or dead leaves from these grass-like plants. Due to the density of blue avena and regal mist grass, these should not be trimmed down. Instead selectively remove dead material from these plants. Cut back last year’s growth to the main mass of the grass (typically 3”-6” above the ground) with pruners or scissors, without scalping the top of the new growth. 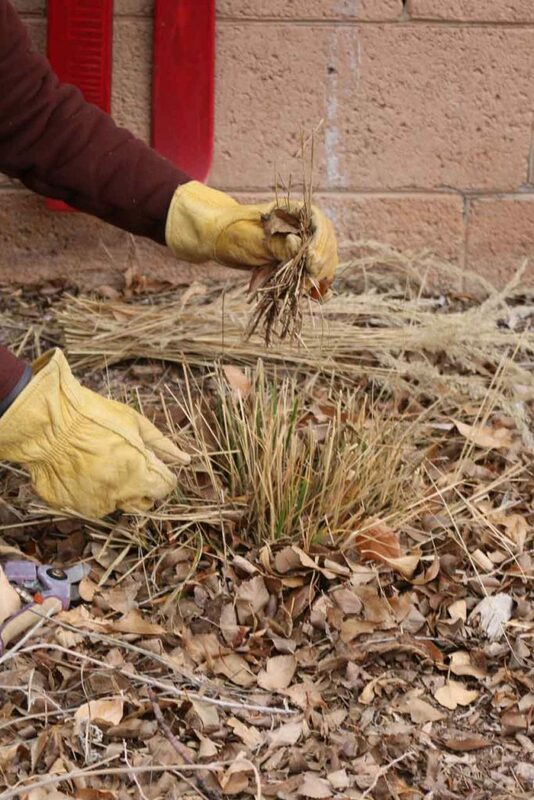 By hand, remove any of last year’s brown foliage and stems remaining in the middle of the grass. For turf grasses, rake out and dethatch with a wire rake. For native lawn grasses such as buffalo and blue grama grass, line trim them then rake out and dethatch. Many native shrubs do not require annual pruning but some respond well to what is called renewal pruning. Renewal pruning is not as drastic as cutting the whole plant back but it does result in a plant with less old, leggy growth. For renewal pruning, use the rule of thirds. Cut back to near ground level about one-third of the oldest stems each year to encourage new healthy growth. This is recommended for shrubs such as lilac, forsythia, cherry sage and butterfly bush. Renewal pruning also will benefit shrubs that become dense with a lot of dead wood on the inside, such as Spanish broom. Roses however are unique and require special methods for pruning. Example plant: Cherry sage: look for the oldest growth and trim off old growth to about 6” above the ground. This will encourage new growth in the spring. Another method of pruning is to formally shear a shrub. Formally shearing or hedging of plants should only be done if the intent is to create a hedge. Typical plants used as hedges are boxwood, laurel, photinia, etc. Most plants used in the landscapes do not need to be hedged or trimmed formally, unless there is a clear reason to limit their growth. After pruning, the plant should look like it does in nature, not a box, ball or cylinder. 4. 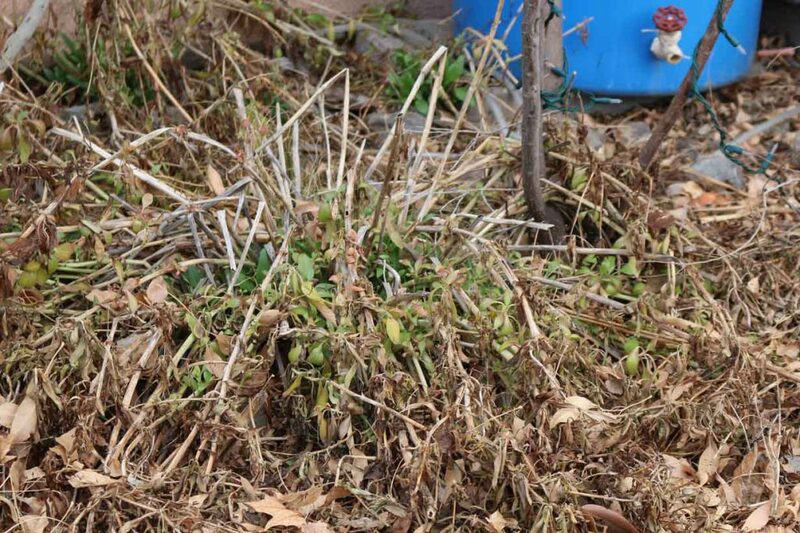 Remove Weeds From Yard. Check out the weed article here. Organic mulch is a natural covering, and includes such material as straw, chipped wood, shredded wood, or pecan shells. (The phrase organic refers to material relating to or derived from living matter. In this context it’s not related to the food or farming method of food production without the use of chemicals.) Organic mulch spread on the ground around plants has the added benefit of retaining moisture in the soil. Certain types of organic mulch will also enrich the soil as it breaks down. A depth of 4 inches of organic mulch will inhibit weed growth by preventing sunlight from reaching weed seeds. 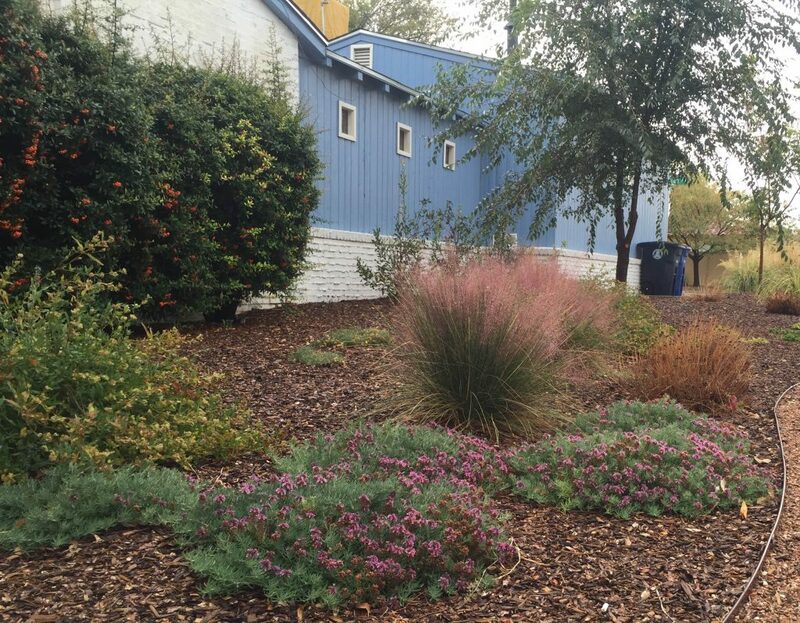 The Water Authority offers a rebate for mulch when used around trees – check out our Treebate here or get information on converting lawn to desert friendly landscape. Organic mulch in a landscape. 7. Recycle Green Yard Waste. There are a few places to take green yard waste. Local composting facility (commercial, industrial, municipal). City of Albuquerque free green waste pick up days. This is typically the last week of April and the first week of May. Compost green waste at home. Author: Jill Brown, ASLA Landscape Architect and owner of My Landscape Coach in Albuquerque, NM. 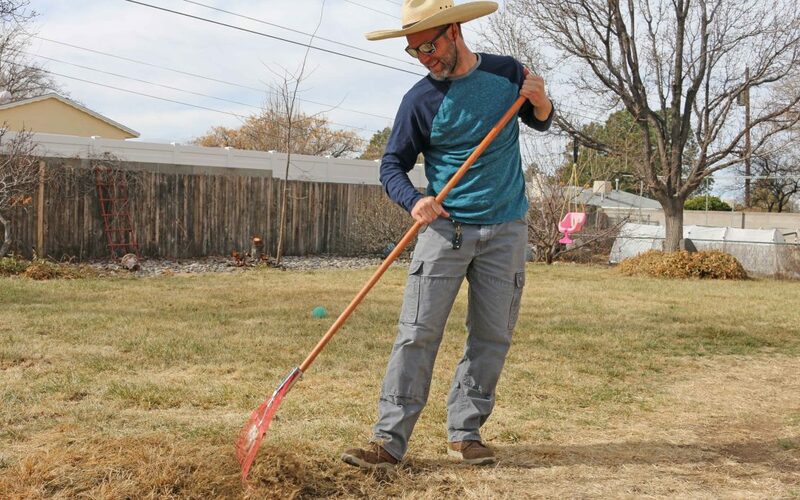 Resources: Growing the Southwest Garden by Judith Phillips, Down to Earth: A Gardener’s Guide to the Albuqueque Area, Fourth Edition by Albuquerque Area Extension Master Gardeners, Curtis Smith formerly of NM Extension Service. Consultations with: Chad Peterson, local native plan maintenance expert.